This week I was in South-Africa working with Aerosud, one of the prominent companies in the Aerospace industry in South Africa, working with the major OEM’s One of the topics discussed in the workshop with Aerosud was the connection between PLM and ERP. As this is a question that occurs so often, see also previous posts, I will address in this post and the upcoming posts the logical steps for an PLM – ERP integration and issues a company might face. For some people I guess the big surprise will be that most of the difficulties and discussions are not on the technical level, but on how a company has organized their data and organizes their data in the future. Although some ERP vendors might want you to believe they offer also PLM functionality in their system, it is always a small subset of the total PLM capabilities. Linking manufacturing documents to an item is not PLM. PLM is managing all product related IP and this requires connections to all information sources during the whole product lifecycle, not only during manufacturing. So if we agree on the above, we understand there is a need to connect PLM and ERP, as both systems have a vital task in a manufacturing company and both work around common information, the product, composed of all its physical items. The physical item, is the shared and understandable entity understood through the whole company. Some companies call their items parts. In order not to confuse between an item and a part designed in the CAD system, i will talk about items, when I mean the physical representation. Items can be a single item, a rivet, a specific metal plate or it can be a complete product or smaller component of a complete product. They have one thing in common, we all identify them with a unique number the item number. In engineering oriented companies you might hear designers say, the item number is equal to the part number of the part or product they are designing, as often in their case what they design on the lowest level of the assemblies, becomes an item. company or project specific items. The characteristic of a standard purchase item is that it has been designed and developed by external companies and that these items can be found in catalogs produced my one or more manufacturers around the world, based on defined standard. For example a M12 Nut, a bearing with specific diameter and performance characteristics. The company that uses these standard parts creates an own definition of the part and makes references to manufacturers who provide these parts in the right quality and standard. These manufacturers appear on the Approved Manufacturer List (AML), which is an engineering task inside PLM to define this list. In addition, based on this approved manufacturer list, the purchasing department will allocate vendors for these parts and based on vendor performance and reliability, they create a List of Approved Vendors (AVL)for these parts. This is a execution task to be defined in the ERP system. So in day to day operation, engineering will define new standard purchase items if not available and this request will lead into an AML and then in ERP towards a AVL of the standard item. It is a combined activity where each of the disciplines has participate. For existing standard items, there is also a process triggered from ERP that influences their usage. 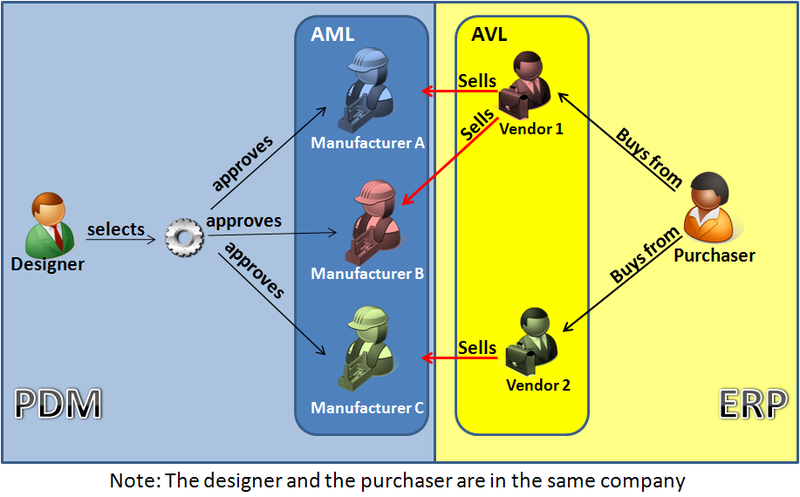 For example a certain manufacturer might stop producing a certain item and this affects the AVL – purchasing raises a flag that the item becomes hard to acquire or even unavailable, which leads to engineering to define a new AML, which might end up in an engineering change as by changing some of the product functionality other standard items can be used to replaced the original defined item. new standard items are introduced through PLM – starting from AML into ERP with the AVL. exiting standard item can become obsolete through PLM – as the company decides not to use them (anymore) or become phase out or obsolete based on a trigger coming from the ERP side, as the AVL has changed. Project specific items are items defined by engineering during the definition of a product. These items need to be manufactured specifically for this product based on the specification provided by engineering. Outside the project these items are not used again anymore as they are too specific. However companies try to standardize even their project specific items, in order to share and reuse them in other products. At this stage, the project specific item becomes a company standard item and is managed to be reused. Both company and project specific items can have revisions as their maturity may grow. As long as the new definition complies to the Form-Fit-Function rules, the new revision of the defined item can replace previous revisions, meanwhile better support future usage. Once agreed on the above concept, we have the guidelines how to connect items between an PLM system and an ERP system. In my next post I will talk more about that, also about how to connect BOMs between PLM and ERP. Thank you for lot of information and got inspired looking at your devotion in study in different areas. One thing I want to know and know the detailed technical things in implementation of PLM in Electricity Generation Plant. Whther we can apply our PLM system or a kind of PLM strategy in this area ? and HOW ? especially a power plant (nuclear or conventional) has a huge benefit from a PLM system which provides the single repository for all asset related data – instead of having various archives around the site and not being able to manage as-built and project engineering data in a single environment. The trigger for ALM based on a PLM system is also strongly related to the cost of labor. When the wages of employees are relative low compared to the software, owner/operators will decide to invest in more people to keep the data accurate, instead of streamlining the plant information. Thank you very much informing me about benefits of PLM in nuclear or conventional power plants. Really I would like to dive deeper in this concept, if you please help me. Even for Solar, Wind Power Generations etc. can I understand the details about available methodologies in PLM or any kind of software for this or we have to customize it ? I would like to know implementation methodologies of PLM in this stream. etc. are all the abov eatributes are Techncial but relevet to ERP side. Are these attributes should coem from PLM or ERP only canhandle it? PLM don’t have all the above listed attributes and one need to customize in PLM part to synch with ERP. what is your view, recommendation technically and functionally inthis situation. Anil hello, when defining the interaction between PLM and ERP it is important to keep in mind that you want to enter data only once and at the place where they show up first. So if we are talking about product definition data, like Motor Type, Pressure, etc. than it is clear they are entered by the engineering in PLM. 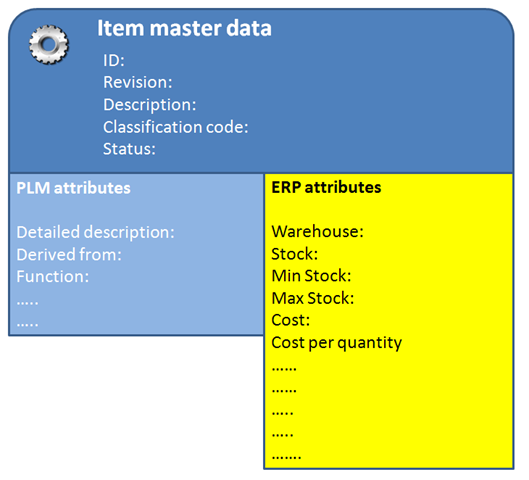 And usually the PLM is the place where the new item is born and gets its number, classification and description. Depending on how your PLM system is working, the classification can bring in specific attributes for the item, many like the ones you indicated. I would call this configuration. Next ERP will store the core attributes also in order to guarantee the perfect handshake (unique ID) and attributes for understanding – potentially again description, classification. But the ERP will extend the item definition with logistical information: purchase conditions, storage location and more. There is no need to store these attributes in PLM as they are not relevant for the product definition. For the same reasons all the engineering specific attributes do not need to be in ERP either. 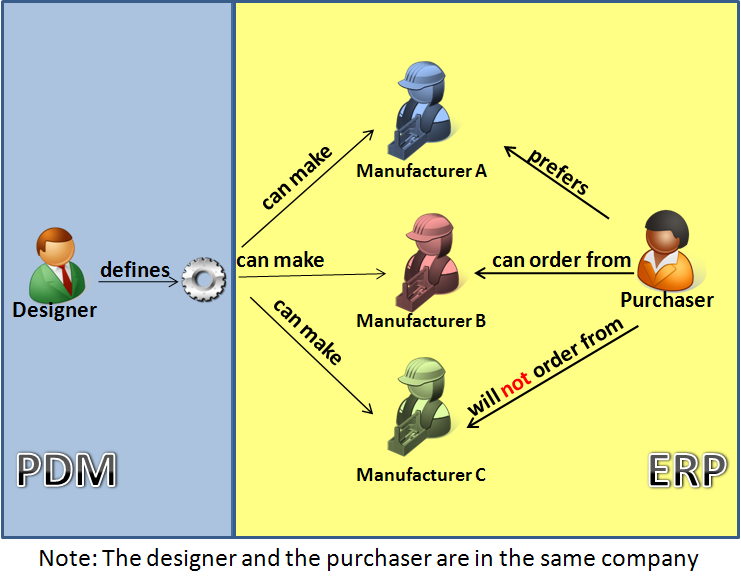 Can you give your insight on how you see the relation between CAD and item on following use case? Let’s take case of 2 screws (identified as 2 std purchase items in ERP) – one with chinese std- and another with EU std- basically the materials are perfectly similar from engineering point of view- which means in my mind then one “CAD” item linked to to “ERP Items” which are dependent of manufacturing location? Hello Thomas, I assume per technology platform you have different ways of implementation. In an item-centric approach, which you seem to follow, I would have the screw CAD-model linked to one item, the EBOM item, as this item represents the related data towards the design intent. Next when you start manufacturing you will have two (or more) manufacturing items fulfilling the need of the EBOM item based on the plant where you are producing. In a model-centric approach, the information is structured around various models and in the case of a screw around the mechanical 3D CAD model, which has the properties as a configuration (you might have different materials with the same geometry). A certain configuration then would link to two different parts in the context of a plant. I hope this answer helped shaping your thoughts otherwise mail me to tacit@planet.nl for a more detailed discussion. « PLM in Greece – It is all about awareness.